If you’re in Dublin and feel like a taste of the great outdoors, you’ll be glad to find out it’s right on your doorstep and the doorsteps of a million Dubliners too. Phoenix Park is the largest park in Dublin and is one of the top attractions in Dublin and it’s now easy to rent bikes to cycle through this beautiful 1700-acre, public park. As the biggest park in Europe, it’s just 3 km outside the city and has a walled circumference of 16 km that contains large grassy plains and tree lined avenues. The name is gotten from the Irish translation for clear water which is ‘fionn uisce’. It’s open every day of the year, every hour of the day. So, what’s to do….. Hire a bike and jump on. It’s easily accessible from our Celtic Group hostels in Dublin. Aras an Uachtaráin – the residence of our Irish president, Michael D. Higgins, it’s open for visitors on weekends. Ashtown Castle and Phoenix Park Visitor Centre – a medieval tower house and an informative display on the Phoenix Park’s history. You’ll find out so much about this brilliant public facility. Dublin Zoo – an iconic site in the park, the zoo has been a vital part of Dublin life for nearly 200 years and host to all creatures great and small, from apes to zebras. Farmleigh House – dubbed by locals as “the most expensive B&B in Ireland”, this is the official guesthouse of the Republic. Magazine Fort – this imposing military installation is where the first Dublin-based action of the Easter Rising took place in 1916. Papal Cross – in what has become famous meeting point, this massive steel cross was erected to mark Pope John Paul II celebrating mass to millions in 1979. Peoples Garden – a landscaped pleasure garden, the people’s garden is loved by all visitors. Phoenix Park Sports grounds have nurtured emerging talent in many sports in the city for generations. They remain a colourful and lively aspect of life in the park. After that, add in the Phoenix Monument, and the Wellington Monument. Don’t forget the deer – generations of Dubliners have been taken there around Christmastime to see the ‘reindeers’ getting ready for Santa. 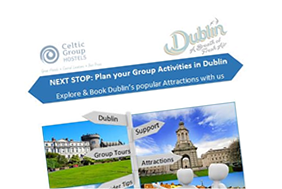 And remember, as part of the trip planning service for groups booking our hostels in Dublin with us, we can organise discounted prices for bike hire in the Phoenix Park and entrance to Dublin Zoo. Let us take the hassle away for your group and organise it for you.